Scott Morrison is to be Australia's new prime minister after Malcolm Turnbull was forced out by party rivals in a bruising leadership contest. Mr Turnbull had been under pressure from poor polling and what he described as an "insurgency" by conservative MPs. Mr Morrison, the treasurer, won an internal ballot 45-40 over former Home Affairs Minister Peter Dutton - who had been Mr Turnbull's most vocal threat. Mr Turnbull is the fourth Australian PM in a decade to be ousted internally. "It has been such a privilege to be the leader of this great nation. I love Australia. I love Australians," he said on Friday. Mr Morrison entered the race after Mr Turnbull lost key backers. After a majority of MPs called for a leadership "spill", Mr Turnbull agreed to step down. 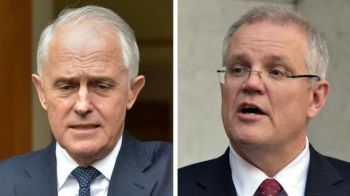 With a mixture of bemusement, anger and sheer frustration: many have described this week as one of the most chaotic in Australian political history. In his final press briefing, Mr Turnbull called the week "madness" and thanked his colleagues for choosing Mr Morrison over Mr Dutton. "We have so much going for us in this country. We have to be proud of it and cherish it," he said. Not a single leader in recent times has succeeded in serving a full term as prime minister, partly because elections come around so often - every three years. So in recent years, prime ministers unpopular in the polls - or with their colleagues - have been swiftly sacrificed from within. Under the Australian system, as in the UK, the prime minister is not directly elected by voters but is the leader of the party or coalition that can command a majority in parliament. Disclaimer: Virgin Islands News Online (VINO) welcomes your thoughts, feedback, views, bloggs and opinions. However, by posting a blogg you are agreeing to post comments or bloggs that are relevant to the topic, and that are not defamatory, liable, obscene, racist, abusive, sexist, anti-Semitic, threatening, hateful or an invasion of privacy. Violators may be excluded permanently from making contributions. Please view our declaimer above this article. We thank you in advance for complying with VINO's policy. Disclaimer: All comments posted on Virgin Islands News Online (VINO) are the sole views and opinions of the commentators and or bloggers and do not in anyway represent the views and opinions of the Board of Directors, Management and Staff of Virgin Islands News Online and its parent company.